The pier and the ferries were still met by a tram service at this time. Not so visible here but Hull trams were the only system in Britain to use a centre groove rail set up. That is the flange on the wheels was in the middle of the wheel and not the side as all others were. 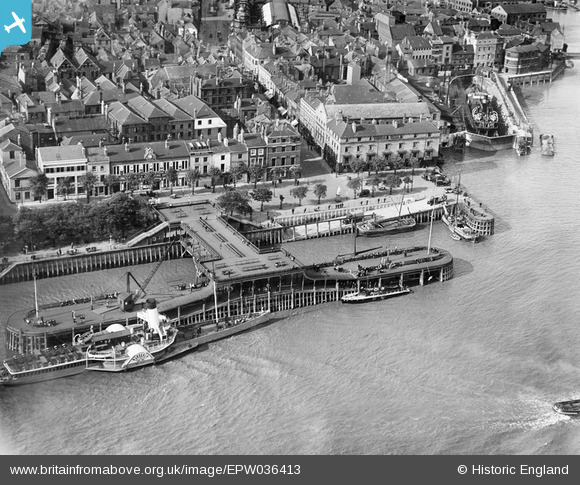 This "top deck" was a popular "Sunday promenading" venue for Hull folk. In fact this is HSL 151, a Thornycroft 62ft High Speed Launch in use by the Royal Air Force. This area was known as the "Oss Wash" in Hull parlance. Where the rully drivers would bring their horses to give them a swill down. An event, my father told me, which attracted great attention as many horses didn't want the often cold water bath and the drivers got more than their fair share. Formerly "Dandie Dinmont" (built 1895) of the North British Rly and later LNER Clyde fleet. Transferred to The Humber in May 1928 and sold for breaking up at Ghent in January 1936. Ha'penny Bridge. Closed In 1934. It was a popular Hull fable that when the maker of this statue realised there were no stirrups, he committed suicide. Hardy likely as the king is portaged as a Roman Caesar and they didn't use such things. This is the booking hall for the ferries. It still exists. It carries the lettering "Manchester, Sheffield and Lincoln railway company" which of course became the "Great Central" railway company and then the L.N.E.R. It was true that the British Railway's doctor had an office on the first floor, I know because I have been to see a doctor there during my railway service. It is an ex Great Central railway vessel,under the ownership of the L.N.E.R. since 1923. Don't forget the P.S.Wingfield Castle which is these days, a floating museum at Hartlepool.